Homeowners in the Kansas City, Missouri, area know that when it’s time to replace their gutters and downspouts, it’s time to call 31-W Insulation. We are a home improvement company with a proven track record of providing stellar products, professional installations, and friendly customer care, all of which can be evidenced by our long-held A+ rating from the Better Business Bureau. Since 1972, we’ve worked tirelessly to establish ourselves as the go-to company for gutters, downspouts, gutter guards, and more. Do You Appreciate Your Gutters? 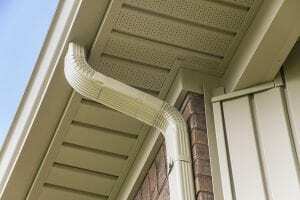 When it comes to protecting your home, gutters and downspouts are a crucial yet often overlooked component. Most homeowners only think about their gutters when it comes time to drag out the ladder and garden hose and scrape out a year’s worth of muck. But the truth is, your gutter system is the unsung hero every time it rains. By diverting rainwater safely away from your home, your gutters prevent what could be costly damage to your roof, siding, and foundation. Because your gutter system plays such a vital role in protecting your home, it’s important to make sure that the gutters and downspouts you have installed are well-crafted and can stand up to anything Mother Nature can dish out. Here at 31-W, we install hardwearing seamless gutter systems made by Spectra Metals, one of the most trusted manufacturers in the industry. Crafted from durable aluminum alloy coil, these gutters and downspouts will stand up to heavy rain, driving wind, and other severe weather conditions. What’s more, since these gutters are seamless, they are less prone to pulling apart like sectional gutters often do. These gutters are also crafted onsite, to your home’s exact dimensions, to ensure that they fit your home perfectly. Choose from more than 20 stylish colors to design a gutter system that complements your home’s architectural aesthetic and design motif. And, when you partner with 31-W, you can have total peace of mind in your investment, as your new gutter system will be installed by our highly trained, company-employed technicians—never subcontractors. If you would like more information about partnering with us to have new gutters and downspouts installed at your home in the Kansas City area, contact 31-W Insulation today and schedule your free consultation.